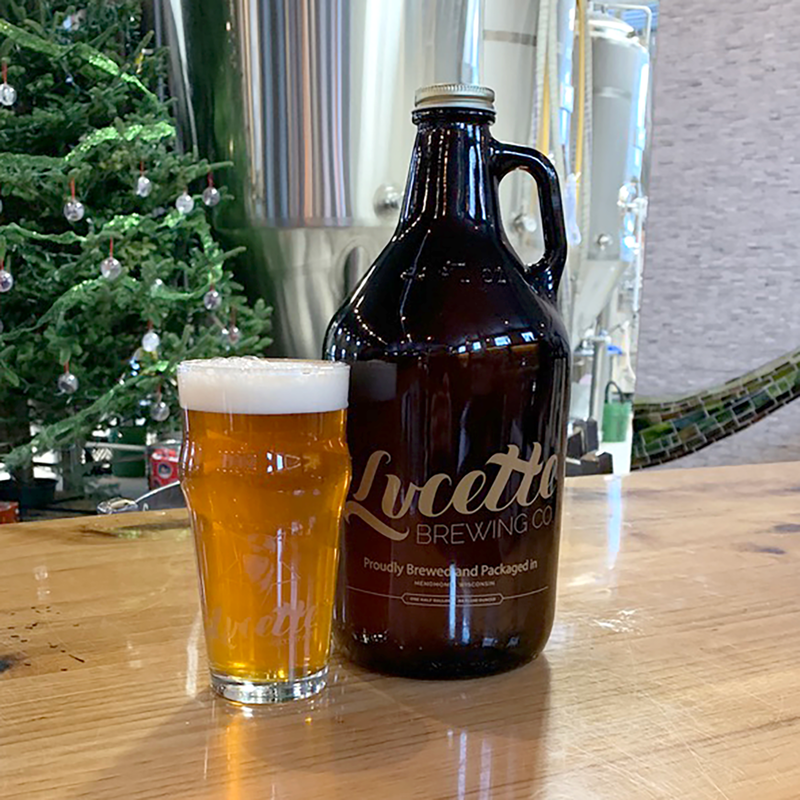 Come down to Lucette Woodfire Eatery and have a freshly poured brew and a woodfire pizza! Traditionally brewed to quench the thirst for stone and coal miners our rustic Belgian style table beer is refreshing with hints of banana esters, clove and honey. Brewed for our friends at the Lumberjack World Championship in Hayward, WI. Crisp, light, crackery, with a noble hop bitterness. This is a darn fine pilsner. The brewery favorite! Simple and amazing. Earthy and complex with a pronounced yeast bite that makes this beer one of a kind! Brewed for our friends of 44North-Altoona, our dry hopped lager is brewed with new German hop varieties, and a touch of rye. Light, citrusy and mild bitterness. Double dry hopped New England IPA is the bigger burlier brother to Tapper. Brewed with Mosaic, Amarillo, Simcoe, and Idaho 7, sweet citrus flavors, and a candy finish. 'Beer to Keep' French style Farmhouse ale has a sweet aroma accented by subtle caramel notes and earthy connotations from the yeast. Medium bodied with a silky sweet mouth-feel that finish dry. Big sister to Shining Dawn. Earthy nose with tastes of complex fruit, spices and honey. Alcohol warmth with clean dry finish. Rich malt characteristic, brewed with Belgian Dark Candi Sugar with flavors of plum, dark cherry, and candy coated dates. Toasted nuts, chocolate, light coffee, malt forward, mildly bitter, cozy alcohol warmth. Brewed for our friends at 44 North-Altoona, this IPA is brewed with Cascade and Michigan Copper hops. Dry pleasant bitterness, watermelon jolly rancher flavors and sweet aroma. Slow Hand Stout is our house stout, aromas and flavors of roasted malt, coffee and rich dark chocolate. Creamy mouthfeel and medium sweetness balance out it’s dry finish.. Proudly brewed in cans and on-tap all year long! Never Fake, Diluted, or Overproduced. The Farmer's Daughter is a Blonde ale with a malty and fruity aroma. The addition of coriander and Grains of Paradise also lends mild spicy aromatic qualities. This beer is very refreshing and has a light malt character with minimal hop flavor. This is a very easy drinking, approachable, thirst quenching ale. Brewed specifically for our friends at American Birkebiner in Hayward, WI. This drinkable malt forward Amber Ale has aromas of sweet bread and caramel. Expect a toasty front with a slight bitter yet clean finish. Our first Lager is brewed for the La Crosse Logger baseball team. A young, fresh, malty Lager that is easy drinking and refreshing. Our märzenbier has as light malt flavor, mild hop bitterness and subtle sweetness. Brewed for fall and the enjoyment of all. (No Growlers) Cans available! Single hop pale ale is brewed with all Eldorado hop. Light breadiness with flavors of lemongrass, pear, and melon. Sweeter in taste, coffee and chocolate, soft and smooth mouthfeel, enjoyable clean finish. Full bodied, balanced, chocolate forward porter brewed with crystal malt, oats and chocolate malt. Crisp, refreshing light ale with notes of lemon and straw are balanced with strong yeast character with a frothy head. Clove like phenolics and banana esters, rose hips give floral aromatics, dry finish. Brewed with Mosaic, Citra, and Amrillo hops with a touch of honey malt and oat. Moderately bitter with flavors of mangos, papaya, and oranges. An ode to the king of West Coast hip-hop, this West Coast IPA brewed with Rakau , Columbus, and Amarillo hops lends to stone fruit and melon flavors and aromas. Slightly grassy and a bitter finish.